Update! 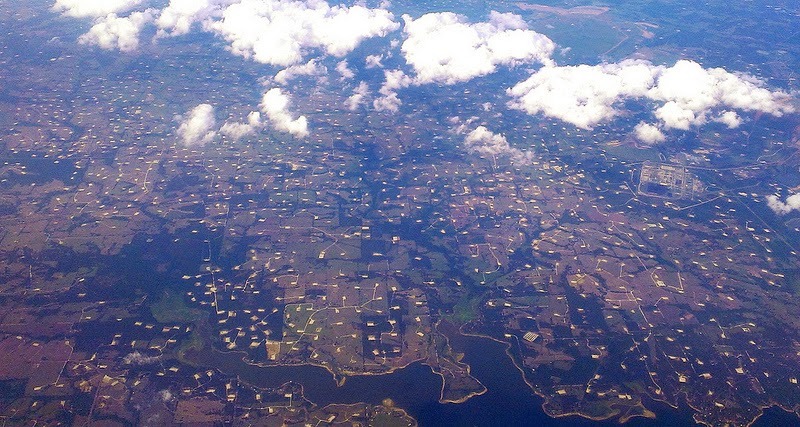 A reader pointed out that the image is showing a traditional oil field - not an oil field with fracking wells. In an earlier article, How Europe almost ran out of timber and how it relates to peak oil, we talked about how the world is running out of oil. United States used to be the largest petroleum producer, but since they ran out of conventional oil wells, the largest producers of oil today are Saudi Arabia and Russia. If you remember the BP Deepwater Horizon oil spill in 2010, you realize that it's impossible to find oil in the US which is easy to recover from the ground. Why would BP drill 1500 meters under the ocean - if they could find the same oil on land? Well, you can find the same oil on land, but that oil is not easy to drill for either. Due to new technologies and a high oil price, US has turned to "fracking" to drill for oil within the borders. These new types of oil and gas wells are also going under the name "shale" or "unconventional". The basic idea is that you drill a hole in the ground, first down into the ground, then sideways into the shale rock. You add a proppant (a mixture of sand, water and chemicals) into the hole, and that proppant will now make it easier to recover the oil and gas from the hole. According to Wikipedia, the first experimental use of hydraulic fracturing was in 1947, and the first commercially successful applications were in 1949. As of 2010, it was estimated that 60 percent of all new oil and gas wells worldwide were being hydraulically fractured. As of 2012, 2.5 million hydraulic fracturing jobs have been performed on oil and gas wells worldwide, more than one million of them in the United States. The problem with fracking is that we are going to run out of also that oil, so fracking is only a temporary solution. According to my expert reader (see the comment section), the picture I assumed was showing fracking is really showing a traditional oil field. The brown patches in the image below are gravel pads that serve as a fire break around the well head. "Saw these strange new human-made landscapes on my flight from Sacramento to Houston. Not farming, not subdivisions, but many miles of rectangular patches etched out of the earth, some with pools next to them, all with roads to them. I doubt that people see these when driving on major roads - I never have - but they were very visible from a plane. Welcome to your new landscape!"